Former African and World footballer of the year, George Weah has been sworn in as President of Liberia in a ceremony earlier today. George Weah won 61.5% of the votes in the December run-off election, defeating outgoing Vice-President Joseph Boakai who only managed 38.5% of the ballot. 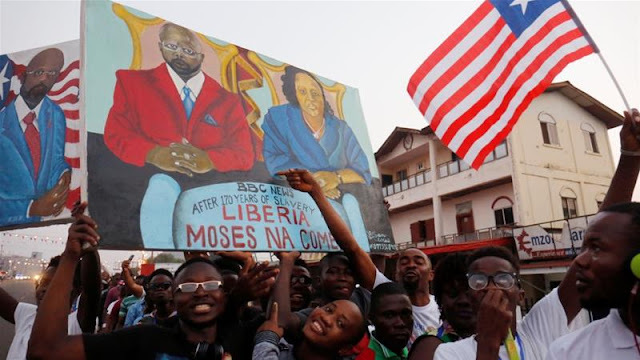 Weah, in 2005, lost to outgoing President, Ellen Johnson Sirleaf, amidst widespread fear that he was too inexperienced for the top job in the country. The ceremony took place at a stadium close to the capital and was the first peaceful democratic transfer of power in the country since 1944 when President Edwin Barclay was succeeded by William Tubman. Eight African Presidents werre present at the swearing in, including those from Nigeria, Ghana, South Africa, Mali, Ivory Coast and Guinea. Many in the country, which has over 80% of its population living in poverty, sees the former footballer as a hero, not only for his exploits on the field, but also for his inspirational journey that has seen him rise from the slums, not only to the peak of his career, but also to become the President of his country. After losing the election to Sirleaf in 2005, Weah went back to school to ready himself for his next step. He attended Devry University in Florida, USA and earned a Bachelor Degree in Business Management (2011) and later got a Graduate Degree in Management from the Keller Graduate School of Management from Devry University in 2013. He also ran for office, this time as a Vice presidential candidate to Winston Tubman but the ticket was defeated again by Sirleaf who won a second term. For many, that could have ended their political journey, but not Weah. In 2017, his aspirations came to fruitful light when he beat 19 other candidates to win the election as the first place winner. In the second round that was held on December 26, 2017 he won again, making him the elected President of Liberia.